What a good day today…I spent most of the day with Pastor Melissa Shaughnessy, who will serve as the Temporary Supply Pastor at CHUP while I’m on the sabbatical. 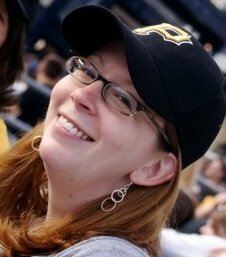 Melissa is a 2010 graduate of Pittsburgh Theological Seminary who grew up in Akron, OH. I’m sad to say that she’s a Browns fan, but other than that, Melissa seems to be a great fit for the opportunity that the sabbatical will offer the congregation. She has recently served at the Oakmont Presbyterian Church, and is eager to serve the congregation as preacher, teacher, pastoral care provider, and friend. I have enjoyed my time with her as we’ve visited with the Cross Trainers, talked about a number of issues relating to the administrative functioning of the church, and visited with some amazing CHUPsters. The folks at CHUP are in for a treat as Melissa comes on board. One special blessing for our community is that Melissa has joined the “Clairhaven Fellowship” – she’ll be living in one of the church-owned homes on Clairhaven St. She’ll be in worship on June 27 and at the church picnic, too. I hope that those of you in town will take the opportunity to welcome her, and that all will be in prayer for her ministry among the great folks at CHUP. The Journey begins with a reunion in Santiago Chile. Some of our friends will remember the year that we hosted Mandy Arriagada Dolz when she was a senior at Schenley High School. Mandy came to us through the offices of the good people of AFS, and we enjoyed a wonderful year introducing her to various aspects of our lives, including family holidays, tubing on the river, Primanti sandwiches, and so much more! This one didn't get away. You didn't think she was here for a year and NOT fishing, did you? We are eager to meet Mandy’s family (including her fiance, Mathias!!!) and learn more about her life in Chile. We will be in and around Santiago for about ten days – not nearly long enough to take in Chile, but we hope it will be plenty of time to get a taste of her world (and expand ours a bit). • in September, Dave and Ariel will be traveling to the Holy Land, spending a month in Israel, Jordan, and Egypt. This is all made possible due to the generosity of the Lilly Endowments, who have provided our congregation with a Clergy Renewal Grant, and the good people of the First U.P. Church of Crafton Heights, who have granted Dave a three-month sabbatical. There will be many adventures to come (not the least of which will be learning to blog!). Feel free to stop by and see what’s going on!